Skinny Meg: Decorating with Humor. Surgery went well, they didn't have to slice me open, so yay! Thank you, thank you everyone, for all the well wishes. It's comforting to know I have so many people who prayed for my recovery! It's not the surgery thats hard it's the carbon dioxide they use to inflate you like a hot air balloon. That crap hurts when it's try to escape out of your head! The day after I was a little too optimistic about my pain and I went flea market shopping. It was meant to be though because I found a pretty little deer head for a good price!! Remember when I told y'all I wanted one to dress up?? I saw this on Pinterest months ago and I've wanted one ever since, but mounted deer heads are not cheap. Which is why you must be patient, if it's meant to be it's meant to be. Of course she's a diva, dripping in jewels and tulle. I'm sure some will think I'm nuts for hanging her in my house. When I decorate, I want to smile, I want my home to make me happy. I want a little humor in my life. Or a lot, depending on the day. Anywho, the deer is adorable. Much better than the pic you posted. The wig on it creeps me out for some reason. That's awesome!!!! You are sooo good at decorating!!! Seriously!!!! That made me LOL!!!! Love her earrings! When I had my last procedure I remember very well the surgery site not hurting near as bad as my shoulder while the gases tried to escape. Ouch! Your deer cracked me up! I would die of laughter if I walked into your mone and saw that! Love it. OMG. I love Bambina! Happy to hear everything went well. Again, I love Bambina. i love you. you are so full of life and you just grab it by the balls... seriously! love that so much about you. 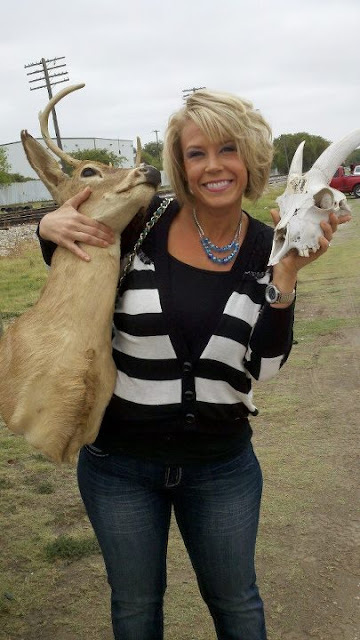 and i love love love the deer- i think your decor is awesome and quirky! Made me smile? Looking at your bling-bling furry friend. ok love your deer head and so thankful that surgery went well!! praying for you! First off you look amazeballs girl! I mean you go girl! I can't believe how awesome you look right after surgery! I get the bad friend award here boo, I didn't know you were having surgery! What was going on? I'm glad they didn't have to cut you open! OMG bwahaahhahahah this is why I love you so much Bambina is rockin' it in your dining room and hey this will be a great conversation starter, so how's dinner? Bambina what do you think? hahahhaah ok so what does your hubs think of your new addition to the family lol! OMG I love the room. LOVE LOVE LOVE IT. Bambina is kick a**. She is such a glitzy diva:) So glad the surgery went well. Happy Monday. hahahaha!! I <3 her!! 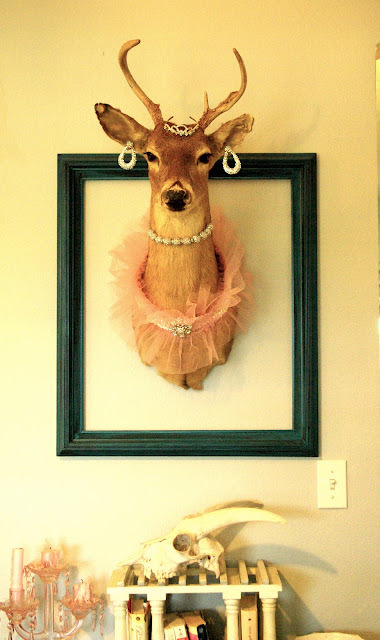 :) I should do that with the deer we have hanging, hilarious. 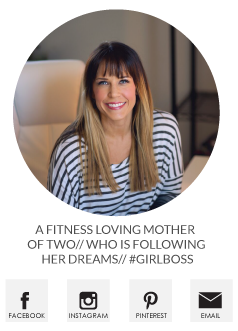 Ps, I love reading your blog. You're so sweet, and funny, and MOTIVATING!!! Love to you Megan! i FREAKING love Bambina! I just had to pin it! hope thats okay! you're a genius! I'm so glad your surgery went well! Where did you get the stencils from that you did on your wall? Love it, and would love to do something like that in my dining room! I'm glad your surgery went well! Sorry you had some pain afterward, but you seem to be in good spirits! Ahahaha! Have you read that book by the Bloggess? 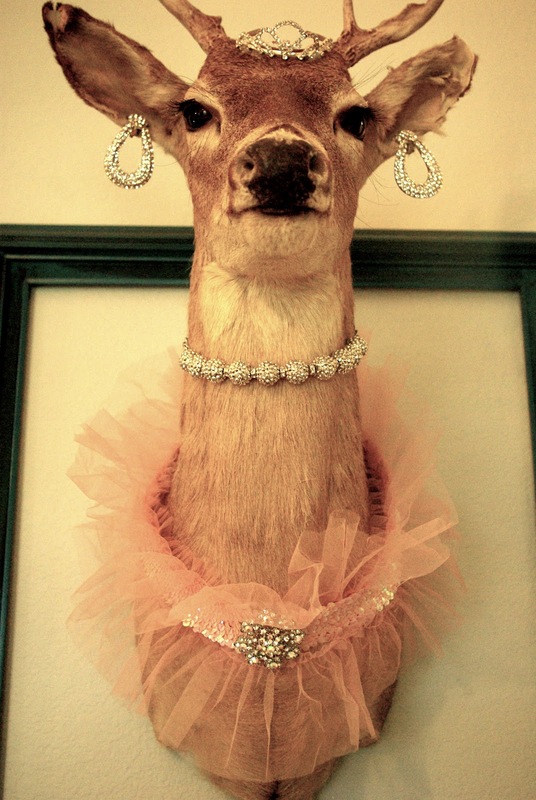 The deer reminds me of her. Glad you are better. I used a rice sock when I had my cysts removed. It really helped with the gas bubbles. LOVE that little lady moose! She adds just the right touch of whimsy! First-I'm so glad you're ok! Second- Bambina is hilarious!!! I love her! What did your husband think? Oh Megan, I love your whole attitude. You need to visit Michigan again, and this time make a pit stop at my house for a happiness makeover. On completely unrelated news, the bottom of your comment form says "choose an indentity" but SHE-Ra wasn't listed. Total bummer. New follower here! Love Bambina! Glad you're surgery went well! How I saved my husband 20 bucks.